Back before Christmas I was able to sneak a few minutes to work on a skirt for Lucy. Even in the midst of the busyness, a girl has to have time with her sewing machine, ya know? However, somehow it has taken me over a month to get photos of it. She wore it to church and I figured that was a good location to take a couple of shots (even if just with my phone). Seriously, there are some really great walls at our new church. Several months ago I made a scarf with this floral fabric. 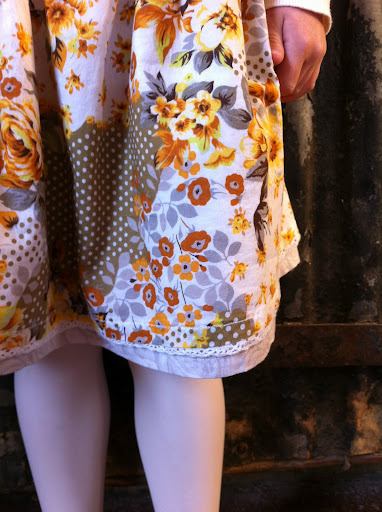 I really love the fabric so I went a bought another yard and some coordinating fabric for a double layer skirt for Lucy (similar to these I made a few years ago). I also bought a bit of lace to put in between the layers. I also decided to make a coordinating headband for her. I'm not sure which I like more, the skirt or the headband! I really look forward to getting my sewing machine back out. It really is hard for it to still be packed up. I don't have a dedicated sewing space in this house, so I've got to figure that part out. But, I am itching to do some sewing! That skirt is darling!! Love the hair bob, too!! So cute! 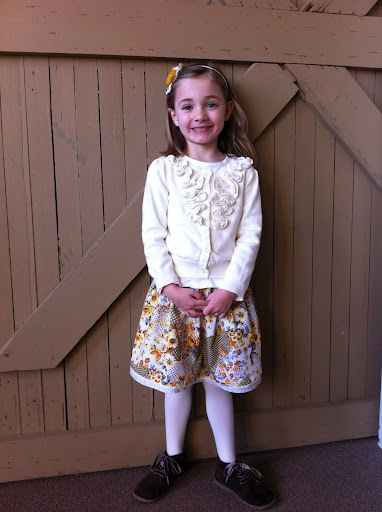 Lucy and the skirt and the headband are darling! That fabric really is amazing. I miss you! I miss craft nights! I hope that you guys are settling in really well. That is really cute. I like the hair pin too--lovely :).